A opportunity to practice and improve your Business and Supply Chain Management skills on Supply Chain Management simulation. This online course prepares participant in the basics of supply management and procurement operations and the role of procurement within an organization’s overall supply chain. The course includes a unique supply chain training simulation ChainSim where you can train the key elements of sourcing and procurement including: strategic sourcing, supplier management, supplier identification and evaluation, and the importance of cross-functional collaboration. One month open all seven courses to practice your skills. 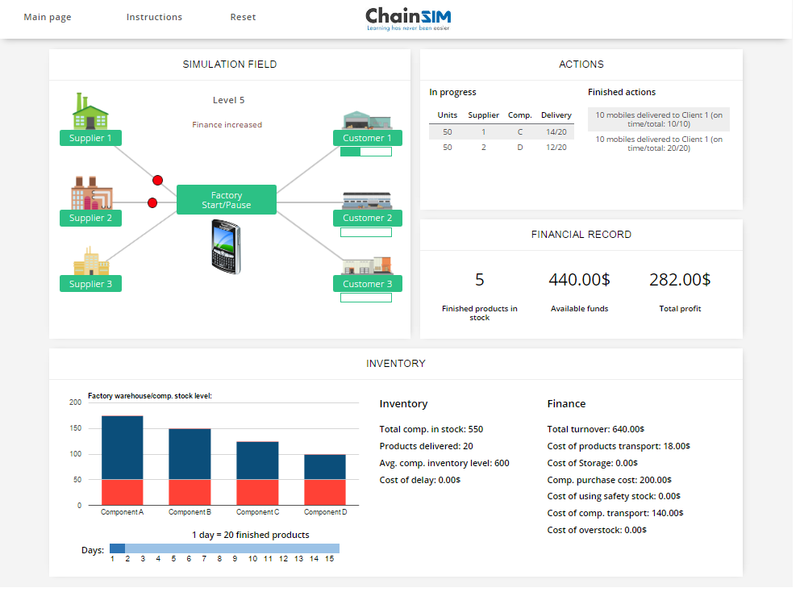 Supply Chain Management Simulation. Web based business simulation platform. Educational tool for students, experts, universities, colleges and Corporate Training Centers. Online diploma for all the participants. After you register, you are sent a confirmation of your online registration and link to the payment via e-mail. Your registration confirmation constitutes proof of registration.